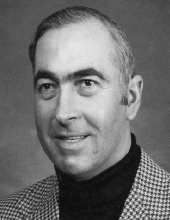 John James Flahive, 82, of Attica passed away on January 28, 2019 at his home. He was born on March 7, 1936 in Hornell, NY to the late John and Anna (Walsh) Flahive. John served in the United States Army after graduating from high school. He was a volunteer for the American Red Cross. John was a baseball coach for the Attica Youth Athletics for over 20 years and was instrumental in developing their athletic field. He was a Railroad enthusiast and loved to travel with his family. He is survived by his loving wife; Lois (Saunders); children Kelly Flahive, Timothy Flahive, Sean Flahive and Shannon Flahive; sister Nora Button. Family and friends are invited to call on Saturday February 2, 2019 from 2:00-5:00PM at Marley Funeral Home, LLC. 135 Main Street Attica, New York 14011. Military Honors will be rendered at the end of visitation at 4:45PM. There will be no formal Funeral Service or reception. In lieu of flowers, memorials may be made to the American Cancer Society www.cancer.org or Roswell Park Cancer Institute www.roswellpark.org. For more information please call (585) 591-1212 or to leave a message of condolence visit www.marleyfuneralhome.com. Arrangements completed by Marley Funeral Home, LLC. 135 Main Street, Attica, New York 14011. To send flowers or a remembrance gift to the family of John James Flahive, please visit our Tribute Store. "Email Address" would like to share the life celebration of John James Flahive. Click on the "link" to go to share a favorite memory or leave a condolence message for the family.